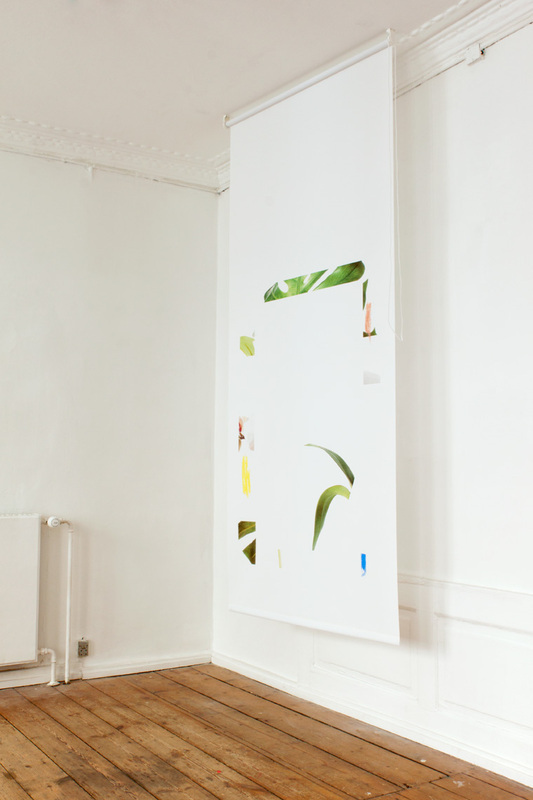 Ditte Gantriis' new solo exhibition consists of a series of new collage works which, amongst other things, examine the relationship between contemporary living, generic aesthetics, and public and private spaces. Accompanying the works is a specially selected soundtrack. 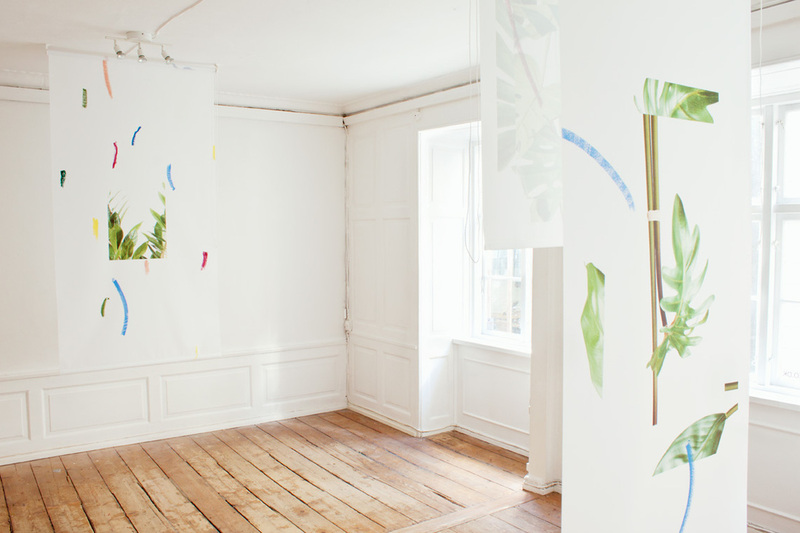 The four large collages are printed on long roller blinds, and all combine both digital images and hand-drawn elements. 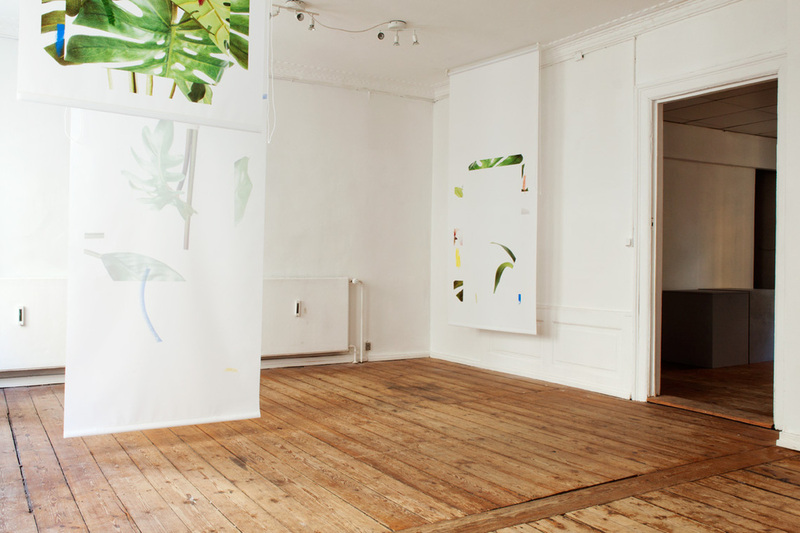 The blinds have been installed spatially in Green Is Gold’s exhibition space - a once inhabited apartment - and are thus separated from their original function. 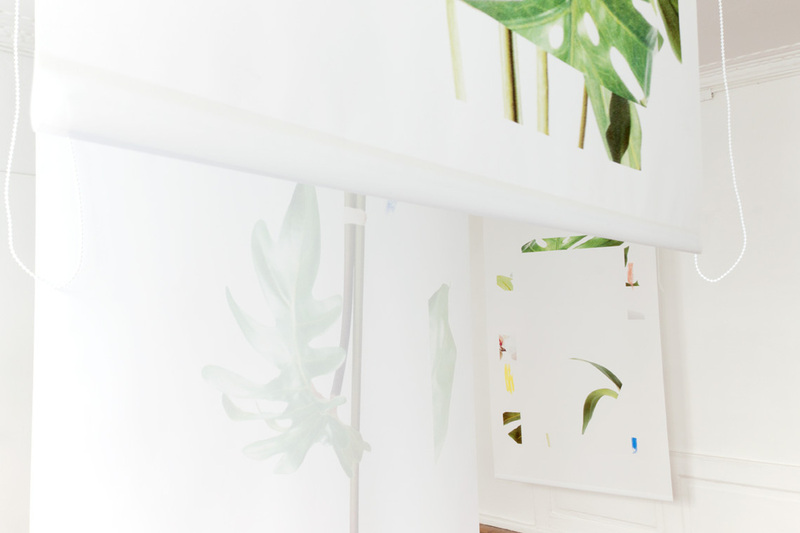 The collages consist of fragmented images of various houseplants collected from online shops, lifestyle blogs etc., whose purpose is to guide us to safe home-design solutions. However the grainy images also evoke enlarged close-ups of the kind of photographic decorations made familiar from franchise coffee shops and restaurant chains or advertising banners from shopping centres and airports. The prints are layered with painterly gestures that, despite their analog quality, seem to reflect the inherent materiality of the digital images. Whether the severely pruned living room plants are real or fake is difficult to tell. The difference appears insignificant and is perhaps of no consequence since both serve the same purpose: to furnish living spaces with pleasant ambience. The blinds are installed in such a way as to lend the two-dimensional surfaces physical form, which again creates a persistent presence. Something similar applies to the somewhat comical and strenuous soundtrack, which in its cheerful and digitally sounding way attempts to keep the collages company. With Company Gantriis asks pertinent questions about what keeps who company and vice-versa. What informs the exhibition, as its title also alludes to, is corporate and anonymous design. This aesthetic is the very opposite of the personal, yet it is perhaps exactly what keeps us company in our private and personal spaces. Ditte Gantriis (b. 1980), graduated from The Funen Art Academy in 2006 and from The Danish School of Design in 2008. She is currently based in Berlin, Germany. 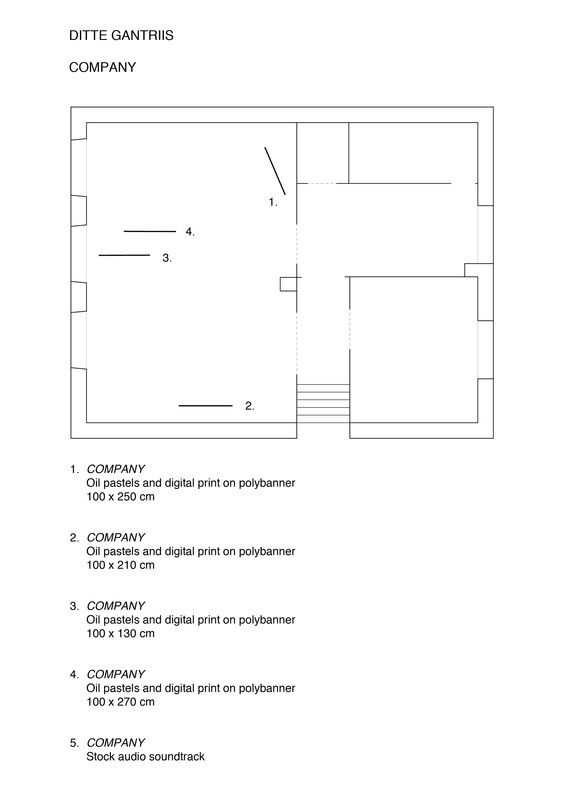 Gantriis works primarily with print making and installation. 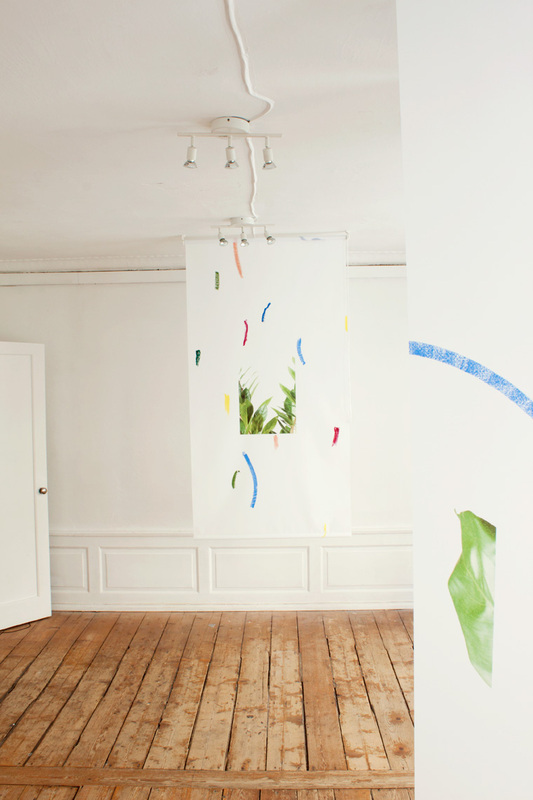 As a recurring feature in her practice the imagery alternates between abstract and figurative form. Working with stereotypes, commercial gestures and notions of contemporary life she examines how objects, images of objects, words and signs are situated in a web of meaning. This multiplicity of signification draws attention to the question of which aesthetics we surround ourselves with, and what emotions we unconsciously invest in them.